© 2004 Plant Management Network. Accepted for publication 5 February 2004. Published 9 March 2004. Dorrance, A. E., Jia, H., and Abney, T. S. 2004. Evaluation of soybean differentials for their interaction with Phytophthora sojae. Online. Plant Health Progress doi:10.1094/PHP-2004-0309-01-RS. Soybean lines, each containing a different resistance gene (Rps), are used as differentials to characterize isolates of Phytophthora sojae as physiologic races. Surveys in different soybean production regions have used various sets of soybean differentials thought to carry the same Rps genes. In some instances, isolates of P. sojae have been reported to have different reactions when evaluated in labs using different sets of differentials that were believed to have the same Rps gene. The objective of this study was to compare the consistency of racial classification when three different sets of soybean differentials were challenged with a common set of five races of P. sojae from Ohio and Indiana. Three soybean differential sets (USDA Soybean Germplasm Collection, The Ohio State University, and USDA-ARS Purdue University) were challenged with P. sojae using the hypocotyl inoculation test at OSU and USDA-ARS Purdue. Isolates of races 1, 3, 4, 7, and 25 from Ohio and Indiana had the same reaction on all three sets of soybean differentials for Rps1b, Rps1c, Rps1k, Rps3a, Rps3b, Rps3c, Rps6, Rps7, and on differentials Harlon, Harosoy 12xx, L59-731, and Union for Rps1a. L88-8470 used as a differential for Rps1a and L93-3312 used for Rps1d did not have the expected response. Isolates of races 4 and 25 from Ohio and Indiana responded differently on differentials with the Rps2 gene because this gene was not used previously to characterize races of P. sojae. A similar reaction occurred when differentials with Rps4 and Rps5 were inoculated with isolates of races 1 and 7, respectively. A standardized set of soybean differentials, corresponding to different maturity groups, for thirteen of the fourteen Rps genes is recommended. A set of host differentials is comprised of lines or cultivars of a host that have one or more resistance gene(s) to a specific plant pathogen. Host differentials are used in the classification of races or pathotypes of plant pathogenic bacteria, fungi, and nematodes (11). Individual genotypes within a set of differentials may change periodically as additional resistance genes are identified or as pathogen pathotypes change or adapt to resistance genes that are deployed within a region (20). Phytophthora sojae (M. J. Kaufmann & J. W. Gerdemann) is a host-specific pathogen with more than 55 described races (1,10,12,15,16,23,25,26,27). Recently, the number of virulence genes that have been identified in each pathogen isolate has increased dramatically, which has made the older number classification system cumbersome (10,12,13,17). Hence, pathotypes or virulence formulas are now used to describe virulence patterns based on reactions on sets of differentials (10,12). Races of P. sojae were identified in 1965 using soybean cultivars D60-9647, D60-11082, FC31745, Harrel, and Nansemond (19). Ten years later, a standard set of differentials was adopted by plant pathologists and plant breeders (3,15), which included Harosoy, Harosoy63, Sanga, Mack, Altona, PI 103091, and PI 171442. These differentials allowed researchers to place isolates of P. sojae into groups of physiologic races. Subsequently, two sets of soybean differential isolines were developed by backcrossing resistance into the soybean cultivars Williams (25) and Harosoy (5,6) (Table 1). Currently, there are Rps genes that confer resistance to P. sojae at eight loci, of which two are comprised of an allelic series (2,4,8). Over the past twenty years, most characterized strains of P. sojae races have been based on host differentials that contain Rps1a, Rps1b, Rps1c, Rps1d, Rps1k, Rps3a, Rps6, and Rps7 (3). Recent surveys have used host differentials with additional Rps genes (10,12,13,21,23,26). Table 1. Soybean differentials originating from the USDA Soybean Germplasm collection (USDA-PGC), The Ohio State University (OSU), and USDA-ARS Purdue University (USDA-P) evaluated with five races of Phytophthora sojae. a The name of the cultivar or soybean line of each of the differentials along with the accession designation in parenthesis if it is deposited in the USDA Soybean Germplasm Collection in Urbana, IL. 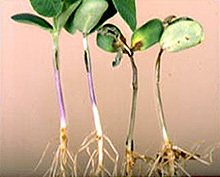 In many cases, soybean cultivars or lines were used as differentials for P. sojae prior to the identification of resistance gene(s) in the line (2,15,19). Subsequently, a previously unidentified Rps gene or two Rps genes were identified in some of these cultivars, i.e., Tracy. For example, Harosoy was regarded as the universal "suscept" in standard differential sets used to characterize races of P. sojae during the 1960s and 1970s, but eventually, P. sojae isolates were discovered that had a resistant interaction with Harosoy (18). Resistance expressed by Harosoy was conferred by the Rps7 gene (2). Sets of differentials used to classify races of P. sojae are not uniform among all researchers. In some instances, the race classification of the same isolate of P. sojae differed among labs that were using differentials that were believed to carry the same Rps gene. Thus, periodic reassessment of differentials is required to minimize differences between studies as well as to make recommendations for future pathotype evaluations. The objective of this study was to compare the consistency of racial classification when three different sets of the standard soybean differentials were challenged with a common set of five races of P. sojae originating from Indiana and Ohio. Sets of the host differentials were obtained from the USDA-ARS Soybean Germplasm Collection (R. Nelson, University of Illinois), USDA-ARS Purdue University and The Ohio State University (Table 1). Seeds of the soybean lines from the Germplasm Collection were increased at The Ohio State University (OSU), Ohio Agricultural Research and Development Center, Wooster, OH. Increased sets of differentials were then used for subsequent evaluations. Five races of P. sojae -- race 1 (vir 7), race 3 (1a, 7), race 4 (1a, 1c, 7), race 7 (1a, 3a, 6, 7), and race 25 (1a, 1b, 1c, 1k, 7) -- from both OSU and Purdue were used to evaluate the response of the differentials. The differentials were evaluated at both locations with both sets of isolates using a hypocotyl inoculation technique in laboratory trials (Ohio) and in greenhouse trials (Indiana) (1,4,16,22). The hypocotyl inoculation technique is the preferred method for classifying races of P. sojae because there is no interference with partial resistance or field resistance that is expressed in the roots (Figs. 1 to 3). Eight plants of each differential were inoculated with each isolate. At each location, all differentials were evaluated with the same isolate at the same time, but different isolates were evaluated at different times. The reactions were scored as a resistant reaction (R), intermediate (I), and susceptible (S) based on the number of seedlings killed: 0 to 2; 3 to 5; and 6 to 8 dead, respectively. The trials were repeated at each location. The pathotypes were then compared among trials. Fig. 1. (A) Rps gene expression is evaluated with the hypocotyl inoculation technique where macerated mycelium of P. sojae is placed in the hypocotyls of 7- to 10-day-old soybean seedlings. Plants are kept in a humid environment for 15 to 24 hours following inoculation. 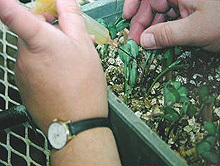 The plants are evaluated 5 to 10 days following inoculation. (B) The presence of a dying or expanded lesion indicates a susceptible or compatible interaction. Resistance response is expressed has a healed wound and healthy seedling. Fig. 2. 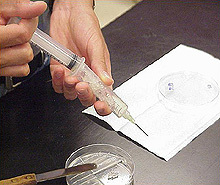 Inoculum for the hypocotyls inoculation is macerated by placing a P. sojae colony from a 7-day-old culture grown on ½-strength lima bean in agar at 15 g/liter into a syringe and passing it through once. Fig. 3. 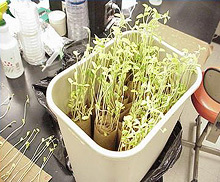 (A, B) For laboratory evaluations of the Rps genes, etiolated seedlings are inoculated 7 days after placing on germination paper. The resistance reaction is a necrotic area at the inoculation site; a susceptible interaction is a slowly expanding brown lesion. Reactions of the same isolates on differentials in trials at Ohio and Indiana were identical with two exceptions. The differential, Haro16 (Rps1d), was resistant to P. sojae OHR7 in the Indiana trial but susceptible to this isolate in the Ohio trial. Also, the differential L85-2353 (Rps4) was resistant to P. sojae INR7 in the Ohio trial but susceptible to this isolate in the Indiana trial (Table 2). Changes in reactions of P. sojae isolates on differentials occur over time. Temperature following inoculation, bacterial contamination, and excessive wounding during inoculation alter this response and affect racial classification. Table 2. Reaction of ten isolates of P. sojae representing five races from Ohio and Indiana on three sets of differentials from USDA-ARS Soybean Germplasm Collection, Ohio State/OARDC (OSU), and USDA/Purdue University (Purdue) to determine resistance (R) or susceptibility (S). * Indicates data from USDA-Purdue compared to Ohio State University where the results were not the same for the same isolate in the two locations. Races 1, 3, 4, 7, and 25 from both Ohio and Indiana had the expected reaction on all lines in the three sets of differentials used for Rps1b, Rps1c, Rps1k, Rps3a, Rps3b, Rps3c, Rps6, and Rps7; and on the differentials Harlon, Harosoy 12xx, L59-731, and Union used for Rps1a (Table 2). However, several differentials did not have the expected response following inoculation with these races of P. sojae. L88-8470, a differential used for Rps1a, had resistant reactions to races 3, 7, and 25 whereas the other four differentials used for Rps1a were susceptible (Table 2). This indicates that Rps1a is not the Rps gene(s) present in L99-8470. L99-3312, a differential used for Rps1d, was susceptible to races 3, 4, 7, and 25 while the other two differentials for Rps1d, Haro 16, and PI 103091 were resistant except Haro 16, inoculated with race OH7 in the Ohio trial. This indicates that L99-3312 has a resistance gene other than Rps1d. All of the isolates used in this study caused resistant reactions on differential Rps3b. Further evaluations with additional isolates classified as different pathotypes are needed to compare susceptible reactions on Rps3b. Differentials that carried the Rps2 gene, L86-493 (Rps1a and Rps2), L81-4352 (Rps1c, Rps2), L82-1449, and L76-1988 were susceptible to isolates of P. sojae races 4 and 25 from Indiana but were resistant to isolates of these same races from Ohio. Differentials with Rps5 were resistant to isolates of race 7 from Indiana but susceptible to the isolate of the same race from Ohio. In addition, the differential for Rps4, L85-2352, was susceptible to the isolate of race 1 from Indiana but resistant to the isolate of the same race from Ohio. Because Rps2, Rps4, and Rps5 were not used for race classification, these differences are due to the differences in virulence of the isolates and not a reflection of the differentials. The P. sojae populations that are present in the north-central U.S. and Ontario Canada soybean production regions are adapting to many of the commonly deployed Rps genes in commercial cultivars (1,7,10,12,13,17). These genes include Rps1a, Rps1b, Rps1c, and Rps1k. Future pathotype assessment of the P. sojae population within this region should include differentials with as many Rps genes as possible to provide the best recommendations about gene deployment. Based on the results of this study, the soybean differentials presented in Table 3 are recommended for classifying isolates of P. sojae against Rps1a, Rps1b, Rps1c, Rps1d, Rps1k, Rps2, Rps3a, Rps3b, Rps3c, Rps4, Rps5, Rps6, and Rps7. This set of differentials was chosen based on the consistent reactions in our trials. More than one differential is recommended for each Rps gene with two exceptions, Rps1k and Rps4. Differentials were chosen to cover more than one maturity group, which will allow scientists to maintain their own differentials but also be able to compare their results with others. Differentials with Rps1k, Rps3a, and Rps4 that are in earlier-maturing backgrounds are needed. There are several plant introductions that have been identified recently as novel sources of Rps genes, including Rps8 in PI399073 (4,9,14). These sources were not evaluated in this study, but they also should be included in differential sets. Periodic reassessment of differentials will be necessary as more Rps genes are identified and deployed to ensure that studies can be compared across the regions. Table 3. Recommended soybean differentials to assess pathotypes (races) of Phytophthora sojae based on hypocotyl inoculations with P. sojae races 1, 3, 4, 7, and 25.
a Accession designation in the USDA-ARS National Plant Germplasm System (24). Other accessions are available through the Ag-Canada Research Station, Harrow, Ontario. We thank S. Berry and B. Bardall for assistance with field increase of seed as well as P. Lipps, M. Ellis, and an anonymous reviewer for their comments on this manuscript. Salaries and research support provided by State and Federal funds appropriated to the Ohio Agricultural Research and Development Center, The Ohio State University. This is a contribution of the Agricultural Research Service, U.S. Department of Agriculture, in cooperation with the Purdue Agricultural Experiment Station, West Lafayette, IN. This research was funded in part by a joint project of the United States Department of Agriculture, the United Soybean Board, and the American Seed Trade Association. 1. Abney, T. S., Melgar, J. C., Richards, T. L., Scott, D. H., Grogan, J., and Young, J. 1997. New races of Phytophthora sojae with Rps1-d virulence. Plant Dis. 81:653-655. 2. Anderson, T. R., and Buzzell, R. I. 1992. Inheritance and linkage of the Rps7 gene for resistance to Phytophthora root rot of soybean. Plant Dis. 76:958-959. 3. Athow, K. L. 1985. Phytophthora root rot of soybean. Pages 575-581 in: World soybean Res. Con. III: Proceedings. R. Shibles, ed. Westview Press, Boulder, CO.
4. Burnham, K. D., Dorrance, A. E., Francis, D. M., Fioritto, R. J., and St. Martin, S. K. 2003. Rps8, A new locus in soybean for resistance to Phytophthora sojae. Crop Sci. 43:101-105. 5. Buzzell, R. I., and Anderson, T. R. 1992. Inheritance and race reaction of a new soybean Rps1 gene. Plant Dis. 76:600-601. 6. Buzzell, R. I., Anderson, T. R., and Rennie, B. D. 1987. Harosoy Rps isolines. Soybean Genet. Newsl. 14:79-81. 7. Cochran, A. J., and Abney, T. S. 1999. Rps gene combinations needed to control diverse pathotypes of Phytophthora sojae. Phytopathology 89:S104. 8. Diers, B. W., Mansur, L., Imsande, J., and Shoemaker, R. C. 1992. Mapping Phytophthora resistance loci in soybean with restriction fragment length polymorphism markers. Crop Sci. 32:377-383. 9. Dorrance, A. E., and Schmitthenner, A. F. 2000. New sources of resistance to Phytophthora sojae in the soybean plant introductions. Plant Dis. 84:1303-1308. 10. Dorrance, A. E., McClure, S. A., and de Silva, A. 2003. Pathogenic diversity of Phytophthora sojae in Ohio soybean production fields. Plant Dis. 87:139-146. 11. Flor, H. H. 1971. Current status of the gene-for-gene concept. Ann. Rev. Phytopath. 9:275-296. 12. 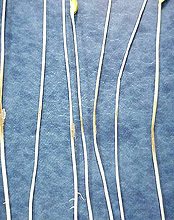 Kaitany, R. C., Hart, L. P., and Safir, G. R. 2001. Virulence composition of Phytophthora sojae in Michigan. Plant Dis. 85:1103-1106. 13. Kurle, J. E., and El Araby, E. M. 2001. Changing composition of Phytophthora sojae races in Minnesota soils. Phytopathology 91:S51. 14. Kyle, D. E., Nickell, C. D., Nelson, R. L., and Pedersen, W. L. 1998. Response of soybean accessions from provinces in southern China to Phytophthora sojae. Plant Dis. 82:555-559. 15. Laviolette, F. A., and Athow, K. L. 1977. Three new physiologic races of Phytophthora megasperma var. sojae. Phytopathology 67:267-268. 16. Laviolette, F. A., and Athow, K. L. 1981. Physiologic races of Phytophthora megasperma f.sp. glycinea in Indiana, 1973-1979. Plant Dis. 65:884-885. 17. Leitz, R.A., Hartman, G.L., Pedersen, W.L. and Nickell, C.D. 2000. Races of Phytophthora sojae on soybean in Illinois. Plant Dis. 84:487. 18. Moots, C. K., Nickell, C. D., Gray, L. E. and Lim, S. M. 1983. Reaction of soybean cultivars to 14 races of Phytophthora megasperma f.sp. glycinea. Plant Dis. 67:764-767. 19. Morgan, F. L., and Hartwig, E. E. 1965. Physiologic specialization in Phytophthora megasperma var. sojae. Phytopathology 55:1277-1279. 20. Roelfs, A. P., and Martens, J. W. 1988. An international system of nomenclature for Puccinia graminis f.sp. tritici. Phytopathology 78:526-533. 21. Ryley, M. J., Obst, N. R., Irwin, J. A. G., and Drenth, A. 1998. Changes in the racial composition of Phytophthora sojae in Australia between 1979 and 1996. Plant Dis. 82:1048-1054. 22. Schmitthenner, A. F., and Bhat, R. G. 1994. Useful methods for studying Phytophthora in the laboratory. OARDC Spec. Circ. No. 143. The Ohio State University, Wooster. 23. Schmitthenner, A. F., Hobe, M., and Bhat, R. G. 1994. Phytophthora sojae races in Ohio over a 10-year interval. Plant Dis. 78:269-276. 24. USDA-ARS. 2004. National Plant Germplasm System. Online. Nat. Germplasm Resources Lab., Plant Sci. Inst., Beltsville Agric. Res. Cen., and USDA-ARS. 25. Wagner, R. E., and Bernard, R. L. 1991. Response of Williams isolines to eight races of Phytophthora megasperma f.sp. glycinea. Soybean Genetics Newsletter 18:236-239. 26. Ward, E. W. B. 1990. The interaction of soya beans with Phytophthora megasperma f.sp. glycinea: Pathogenicity. Pages 311-327 in: Biological Control of Soil-borne Plant Pathogens. D. Hornby, ed. CAB Int., Wallingford, England. 27. Yang, X. B., Ruff, R. L., Meng, X. Q., and Workneh, F. 1996. Races of Phytophthora sojae in Iowa soybean fields. Plant Dis. 80:1418-1420.